Los Angeles Mashup Request Night! Request your favorite mashups, artists, and songs to be mashed-up, and we’ll do our best to mash it up! Yes, we know — we’re just ASKING for it! After all, it’s the return of Mashup Request Night! 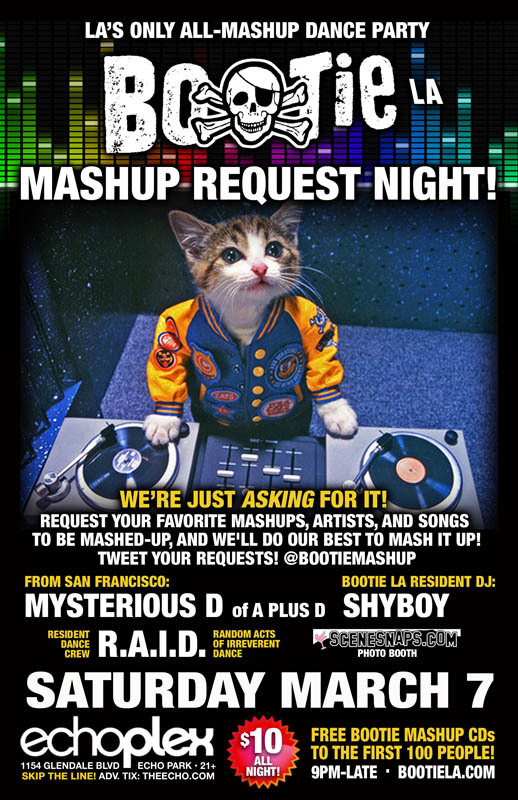 Request your favorite mashups — or artists and songs to be mashed-up — and resident DJs Mysterious D (of A Plus D) and ShyBoy will do their best to play it! You can make requests the old-fashioned way by coming up to the DJ booth and writing it down on the clipboard, or do it via Twitter by putting @bootiemashup in your tweet! Plus, resident dance crew R.A.I.D. will be on hand to keep the energy level high with their go-go insanity, while SceneSnaps captures all the fun! Free Bootie mashup CDs for the first 100 people through the door! Bootie LA NYE 2014 Sh!t Show!